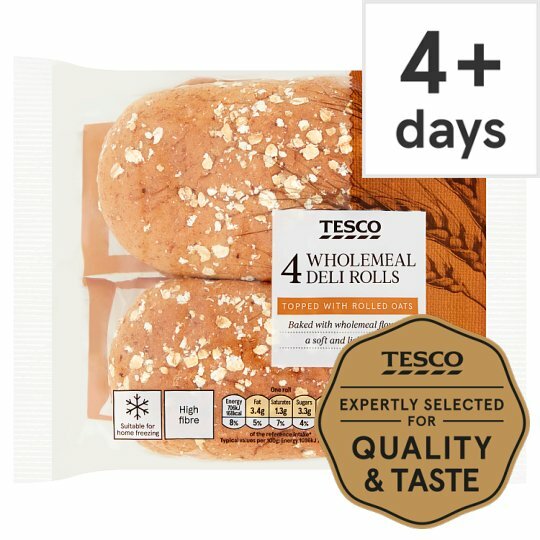 4 Wholemeal rolls topped with rolled oats. Topped with rolled oats Baked with wholemeal flour for a soft and light texture For a New York deli inspired sandwich, layer with pastrami, coleslaw, gherkin and mustard mayonnaise. Wholemeal Wheat Flour, Water, Rolled Oats (4%), Palm Oil, Dextrose, Yeast, Wheat Flour (Wheat Flour, Calcium Carbonate, Iron, Niacin, Thiamin), Salt, Soya Flour, Rapeseed Oil, Preservative (Calcium Propionate), Emulsifiers (Mono- and Di-Acetyl Tartaric Acid Esters of Mono- and Di-Glycerides of Fatty Acids, Calcium Stearoyl-2-Lactylate), Flour Treatment Agent (Ascorbic Acid). For allergens, including cereals containing gluten, see ingredients in bold. Also, may contain peanuts, nuts, sesame seeds, egg and milk.